Very heavy rain overnight with fog early this morning – and it was laundry day! Someone had started complaining that he was running out of socks. The fog lifted to become low cloud, so it was onto the clothes with the washing while we went for a drive to visit the Toy Factory and the Big Rocking Horse. 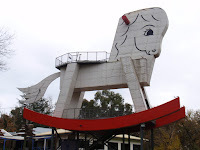 This was a bit disappointing (the weather didn’t help, of course) but there was a $2 charge per person to climb to the lookout and a very good proportion of the stock in the Toy Factory had a little “Made in China” sticker attached. The wooden toys made on site were beautifully constructed and finished, and beautifully priced! Fortunately, our grandchildren are a bit passed the wooden toy stage. Of course, the rain bucketed down when we were only 10 minutes from home and the washing received another rinse, but no extra spin dry. The Barossa Valley is a really picturesque region, with lots of well-maintained heritage/colonial buildings, wineries and vineyards. It was also hairdressing day as the next opportunity wouldn’t happen until Alice Springs – far too long to wait. Very impressed with the result, especially the price. I am starting to wonder why Kingston hairdressers are so expensive!